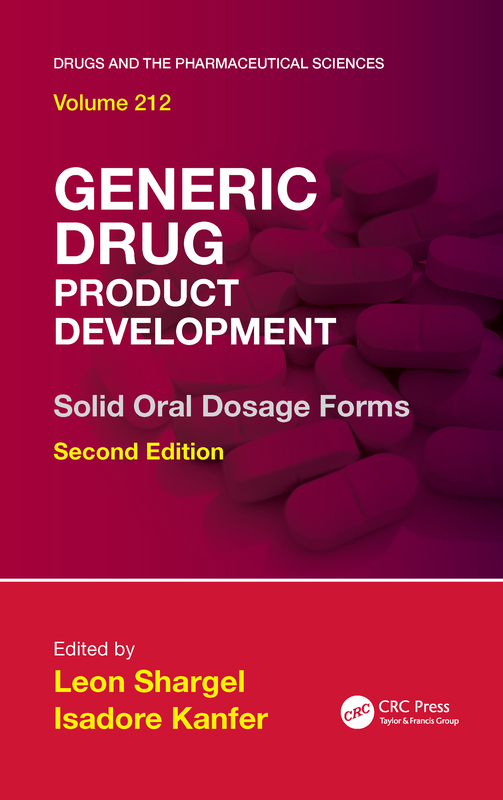 Generic Drug Product Development and Therapeutic Equivalence. Active Pharmaceutical Ingredients. Analytical Methods Development and Methods Validation for Oral Solid Dosage Forms. Experimental Formulation Development. Scale-up, Technology Transfer, and Process Performance Qualification. Drug Stability. Quality Control and Quality Assurance. Drug Product Performance: In Vitro. ANDA Regulatory Approval Process. Bioequivalence and Drug Product Assessment: In Vivo. Statistical Considerations for Establishing Bioequivalence. Outsourcing Bioavailability and Bioequivalence Studies to Contract Research Organizations. Postapproval Changes and Postmarketing Reporting of Adverse Drug Experiences. The United States Pharmacopeia/National Formulary: Its History, Organization, and Role in Harmonization. Legal and Legislative Hurdles to Generic Drug Development, Approval, and Marketing. Index. Leon Shargel, PhD is the manager and founder of Applied Biopharmaceutics, LLC, a pharmaceutical consulting firm. Dr. Shargel is also an Affiliate Professor, School of Pharmacy, Virginia Commonwealth University, Richmond, Virginia, and Adjunct Associate Professor, School of Pharmacy, University of Maryland, Baltimore. He has wide experience in industry and academia and has more than 200 publications, including several leading textbooks in pharmaceutical education and the generic pharmaceutical industry. Dr. Shargel received his Ph.D. in pharmacology from the George Washington University, Medical Center, Washington, D.C., and his B.S. in pharmacy from the University of Maryland, Baltimore, MD. Isadore Kanfer, PhD is Professor and Emeritus Dean of Pharmacy, and former Head of Pharmacy and Dean of the Faculty (1999-2007), Rhodes University, Grahamstown, South Africa. Dr. Kanfer has been a visiting professor at the University of California-San Francisco and the University of North Carolina School of Pharmacy, Chapel Hill. He spent several years in the pharmaceutical industry in Canada and has written or contributed to several book chapters and more than 200 research publications and conference presentations. Dr. Kanfer received his B.Sc. in pharmacy and Ph.D. in pharmaceutics from Rhodes University, Grahamstown, South Africa.